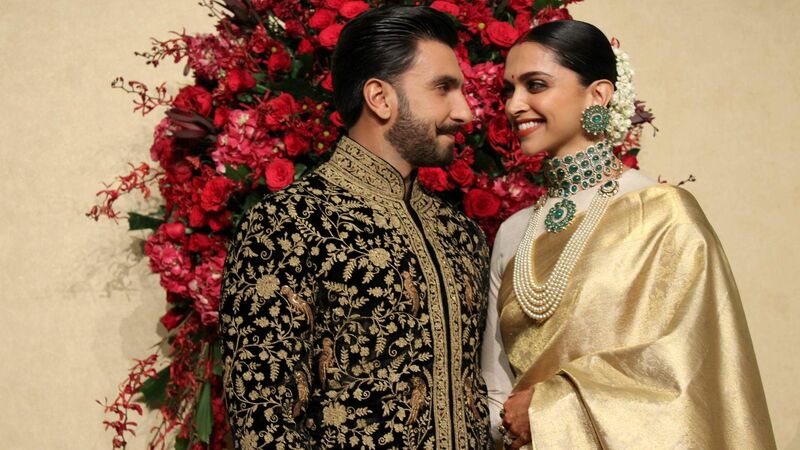 Actors Deepika Padukone and Ranveer Singh’s wedding has been the talk of the town ever since they tied the knot at Lake Como in Italy on November 15. Exactly a week later, the couple and their families hosted the first reception in India, in Deepika’s hometown Bengaluru on November 21. The venue, The Leela Palace Hotel, one of the luxury hotels in the city was decorated with fresh red roses and golden candles following the red-gold theme. The décor wasn’t over-the-top or garish. Everything was in place, including the stage set for the couple’s photo-op for the media. In fact, entry to the media was by invite only, making it quite a private affair and not a free-for-all celeb wedding reception. While everything was appreciated, right from the way the couple looked together, to their chemistry and how Ranveer played the perfect husband, helping adjust Deepika’s sari pallu for pictures, everyone seems to be extremely critical of actress’ golden sari. Social media is abuzz with how the silk sari and the full-sleeves white blouse didn’t quite live up to expectations and it was not even as good as the saris that were worn for the previous ceremonies. Unfortunately, the point that people seem to be missing here is that for someone like Deepika, who comes from a non-filmy family, the sari, more than being a fashion statement, shows how attached she is to her parents. Bought by her mother, Ujjala Padukone from Bengaluru’s Angadi Galleria, it was gifted to Deepika to be worn on her special day. Though the actress is known for endorsing major apparel labels and brands, she stuck to wearing what her mother had chosen for the reception. This gesture was an evidence of how relationships matter to the young woman. Despite all the comparisons between Deepika and Anushka Sharma’s looks, the former still looked like the perfect bride with the sindoor, emerald-diamond necklace set, pearl haar and the red chura, complementing her beau’s black bandhgala with the golden embroidery. More importantly, the couple was dressed perfectly for the private affair that was attended by relatives and close friends of the family. Unlike an out-an-out Bollywood wedding, Deepika and Ranveer’s wedding reception a low-key, yet classy affair, and we guess it will set a new precedent for celebrity weddings.